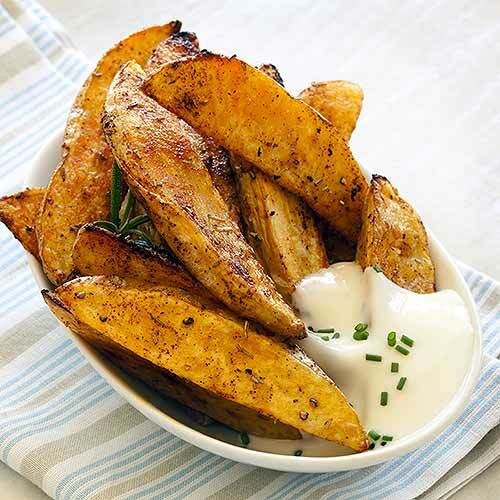 Pretty healthy and full of flavour, these wedges are a great accompaniment for many meals. Simple and fast to prepare too. Bring a pan of water to the boil, then place the wedges into the pan. Par boil for 8 Minutes. Drain the wedges in a colander but be careful not to break them up as the outer edges will become soft at this point. Once dried place them on a baking sheet and drizzle with the olive oil and sprinkle with the seasoning. toss around gently to coat the wedges in the seasoning well. Now stand them pointing upwards skin side down. You may wish to give the baking sheet a shake to move them around half way through cooking.